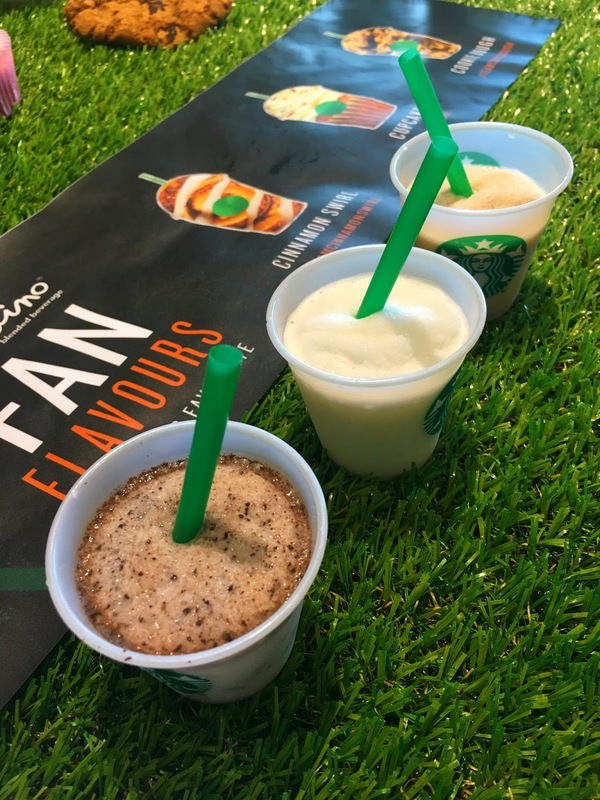 Earlier this month, Starbucks launched their Fan Flavours frappucino campaign, asking customers to choose their favourite flavour combos with the winner becoming available all summer long. I was given an exclusive invite to the Belfast Cornmarket shop sample the new summer menu and brought Caelan along as my sidekick. As much as I like to think of myself as a coffee purist, I do indulge in a frappucino every now & then and leapt at same to try the new flavours of Cinnamon Swirl, Cupcake & Cookie Dough. I am not a fan of cinnamon; it does something to my sinuses and while the Cookie Dough and Cupcake flavours were made without coffee, they were sweet and creamy and totally over the top. 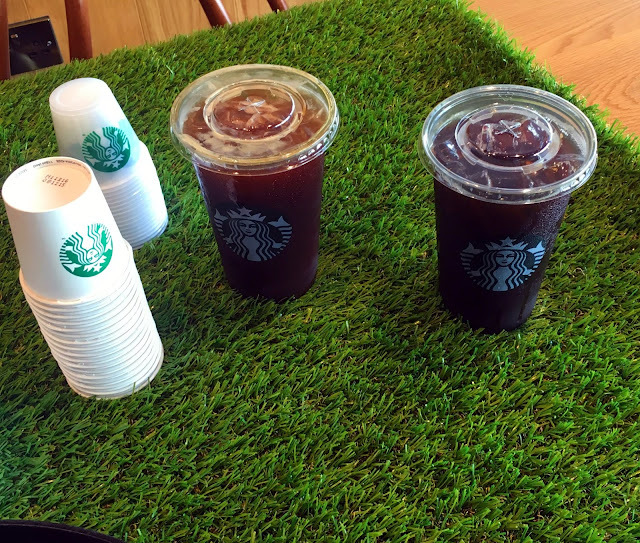 We also got to try the iced coffee selection, including the classic Iced Americano (which many coffee shops simply label iced coffee) and the intense Cold Brew Coffee. 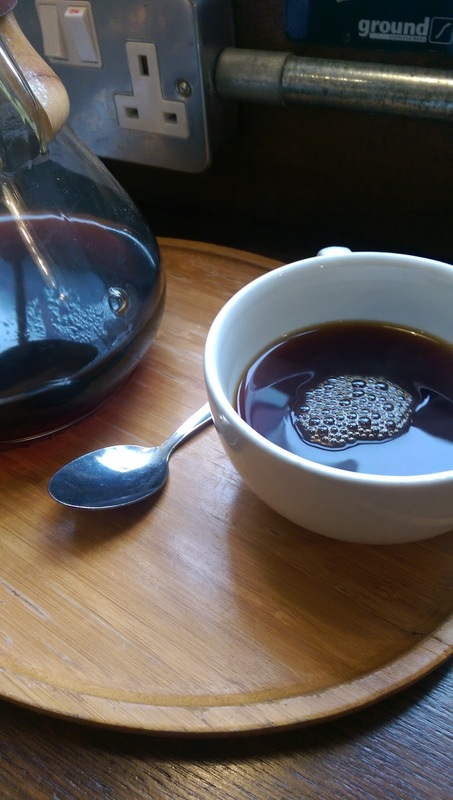 The Cold Brew is made exactly as the name suggests, the coffee beans are brewed in cold water, meaning they release more of their aromatic and flavourful oils. This is pretty much coffee times coffee, it's potent and perhaps not for the occasional coffee drinker. If you prefer a smoother, lighter flavour, opt for the Iced Americano, a classic Americano tempered with cold water and ice. After getting our caffeine fix came the exciting part, we were given free reign behind the bar to have a go at making our own lattes and frappucinos! I love the thought of having a full barista station at home and until the day I can afford it, this was the next best thing. 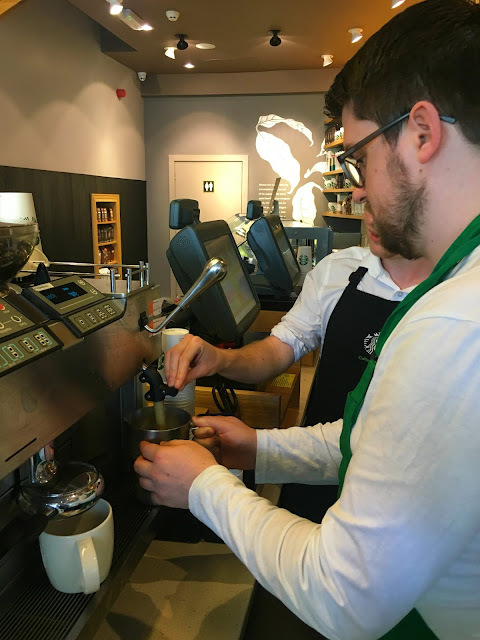 I donned the black apron of the coffee master and stepped behind the bar to be trained by Belfast's regional coffee master Eduardo, who won the Starbucks UK Barista Championship in 2013. 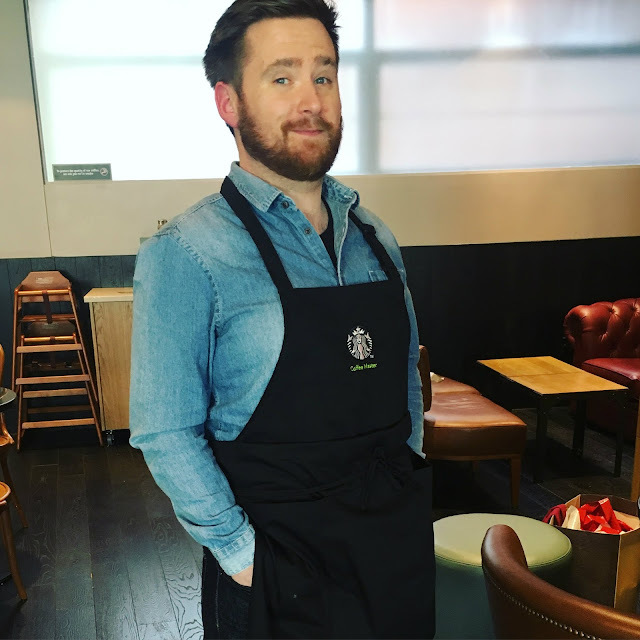 FYI if you ever see a Starbucks barista wearing a black apron, they're the coffee master. 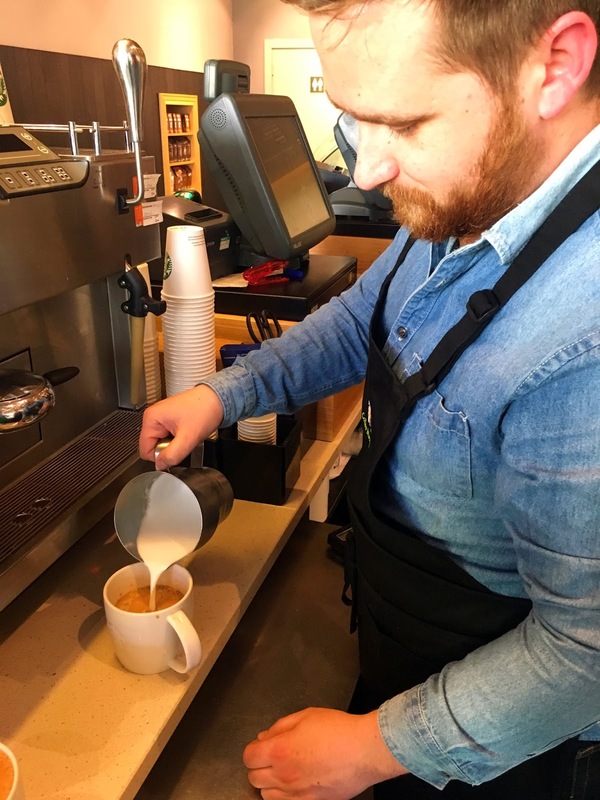 The black apron is akin to a black belt in coffee! 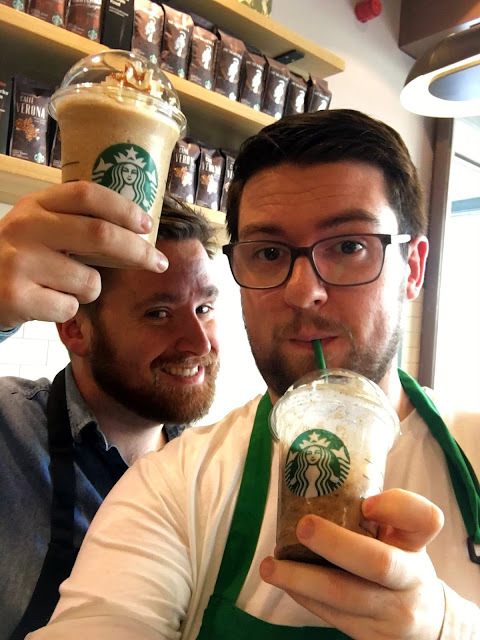 Enjoying our bespoke frappucinos. I went for a classic Nutella combo and Caelan created a banana bread-inspired concoction. 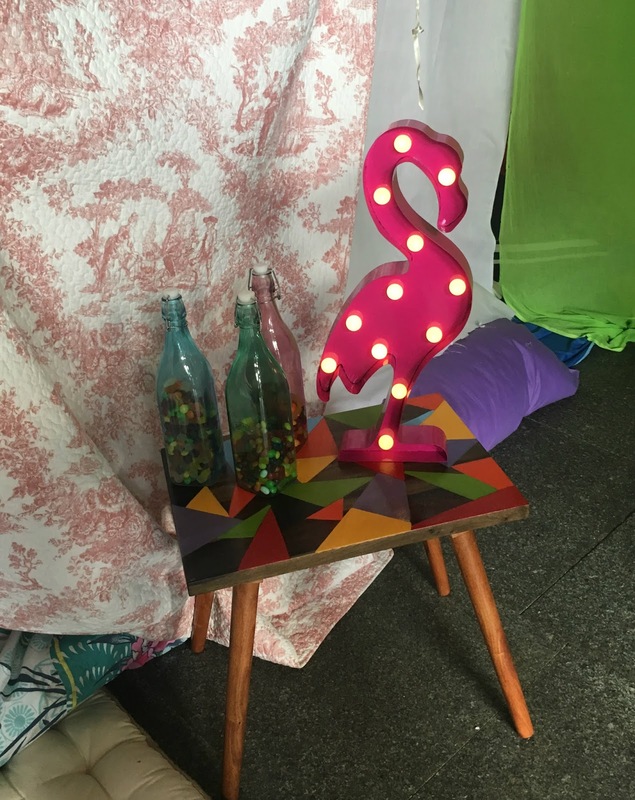 Thanks to Eduardo and Simon of Starbucks for inviting us down for the evening, it was so much fun! They were also kind enough to provide me with a goody bag as a prize to my friends and readers. 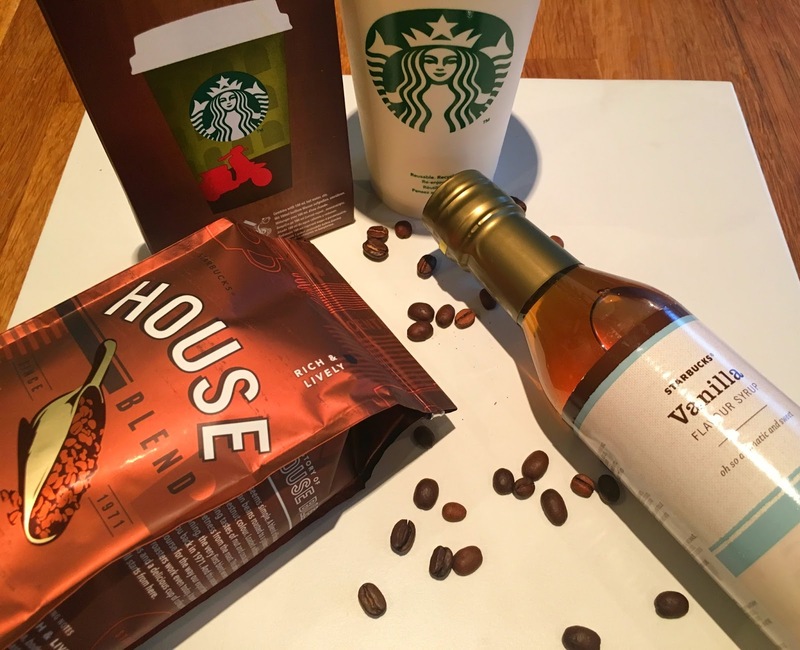 Simply complete the widget below for a chance to win your own bag of Starbucks delights. Today I'm writing about a touchy subject to many men; hair loss. Around 6 weeks ago, I developed alopecia areata. 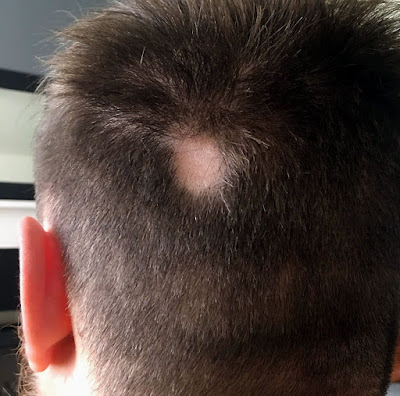 Alopecia areata is an auto-immune reaction, causing hair loss in a single patch. The patches can grow or develop in other areas. It can be a reaction to stress but there are genetic factors also linked if family members have suffered from other auto-immune conditions such as lupus and rheumatoid arthritis, both of which affect my mother. 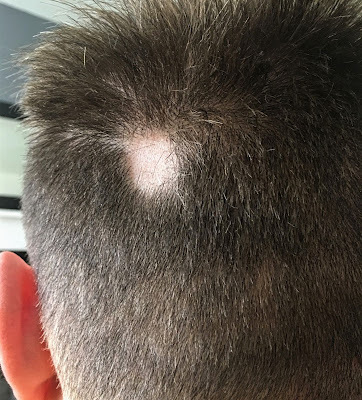 The affected area is on the back of my head so it was not initially spotted, however Caelan noticed it one day on an off chance. My hair was longer then and it was not very noticeable. However, I have since had my hair cut so the patch is much more prominent. The patch is around the size of a 10p and completely smooth. 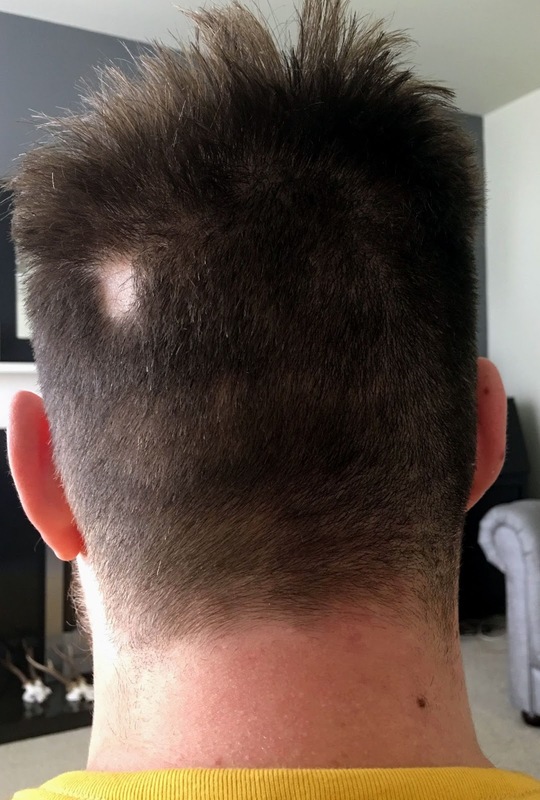 I have had questions such as if it was a scar or a mishap at the barbers but I am keen to be honest and open about the condition. As it's on the back of my head, I don't see it and try not to let it affect me too much. Alopecia areata is not a permanent condition but the affected area can take several years to regrow. In the meantime, it could present in another location, but hopefully it will be contained to my current little crop circle. I thought this was a topic which deserved to be explored and spoken of more. I'll keep up updated on my progress and what changes I encounter along the way. If you are experiencing similar issues, speak your doctor. Visit Alopecia Online for support and further information. 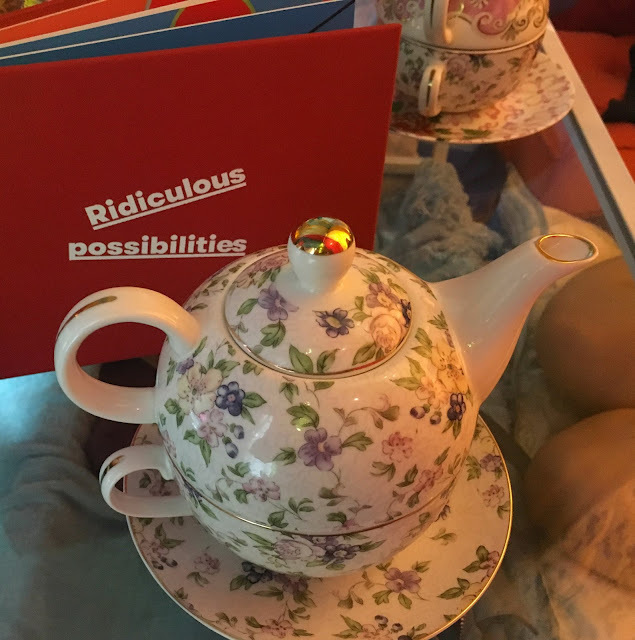 Last week I attended an intimate and unusual event hosted by TK Maxx. TK Maxx is renowned for its diversity and value but isn't everyone's cup of tea. 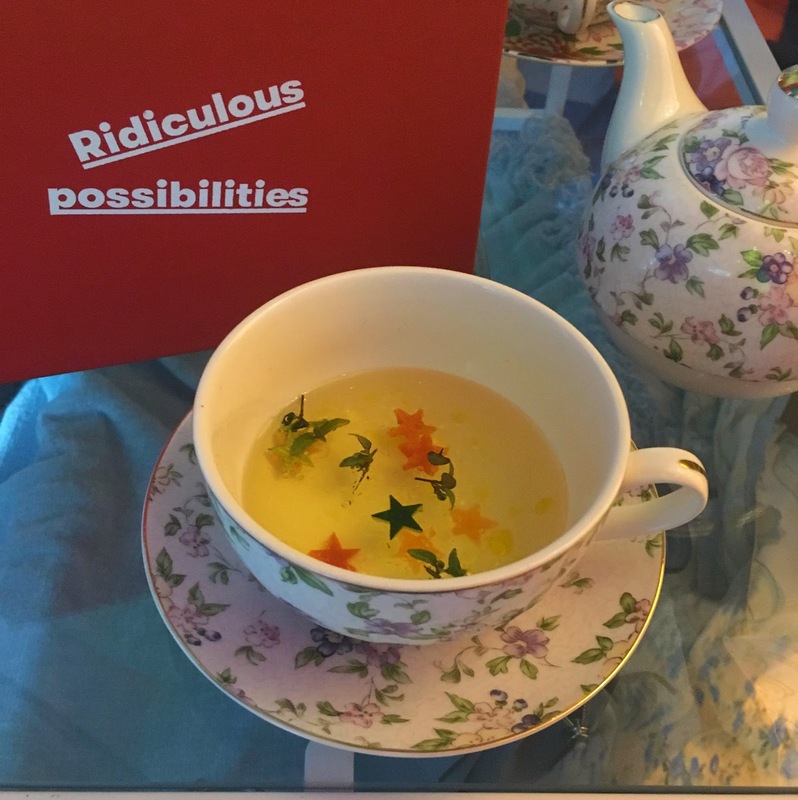 I've heard the old arguments "I can never find anything" or "I can't be bothered looking" but that is the cry of the lazy and the unimaginative. 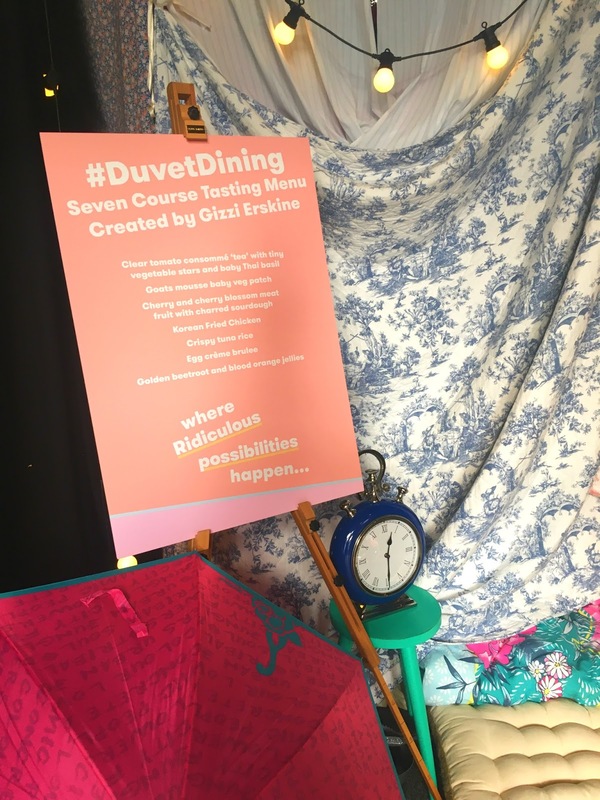 TK Maxx challenges shoppers to go beyond their list or planned buying and just enjoy the ridiculous possibilities presented by this high-street Aladdin's cave. How often have any of us visited TK Maxx and left with something we hadn't thought of? On my last visit, I came away with such disparate items as bamboo socks, a dog harness for Frank and a note book to add to my ever-growing collection. 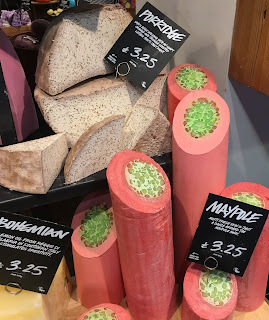 From home wares to fashion, TK Maxx is a deconstructed department store and in my opinion, probably the best destination when shopping for any kind of gift. My companion for the evening was my blogging wife Ruth from Willow Lane blog. 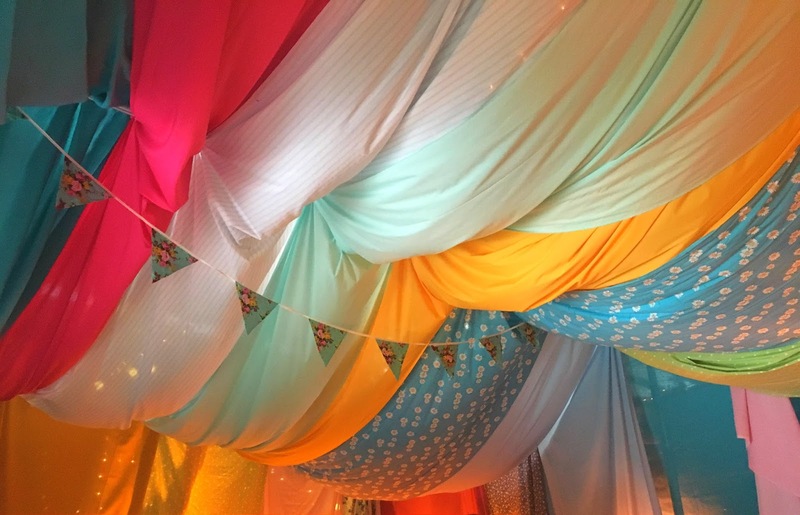 Arriving at The Treehouse in Belfast's AM:PM restaurant, we were met with an imposing blanket fort which was to be our home for the evening. 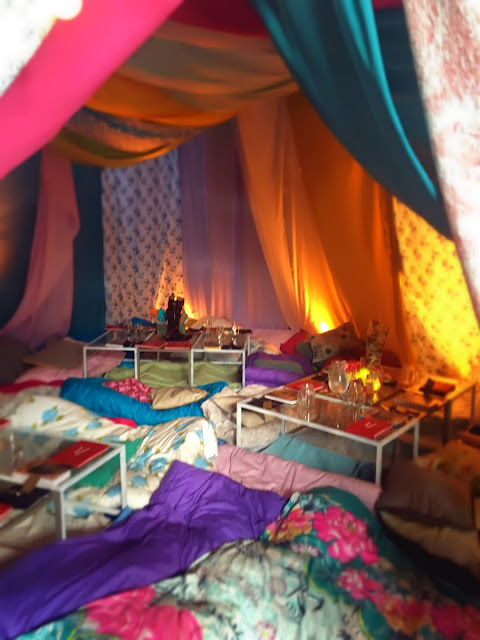 Kicking off our shoes and stepping inside, the floor was covered with cosy throws and pillows, arranged around low tables. 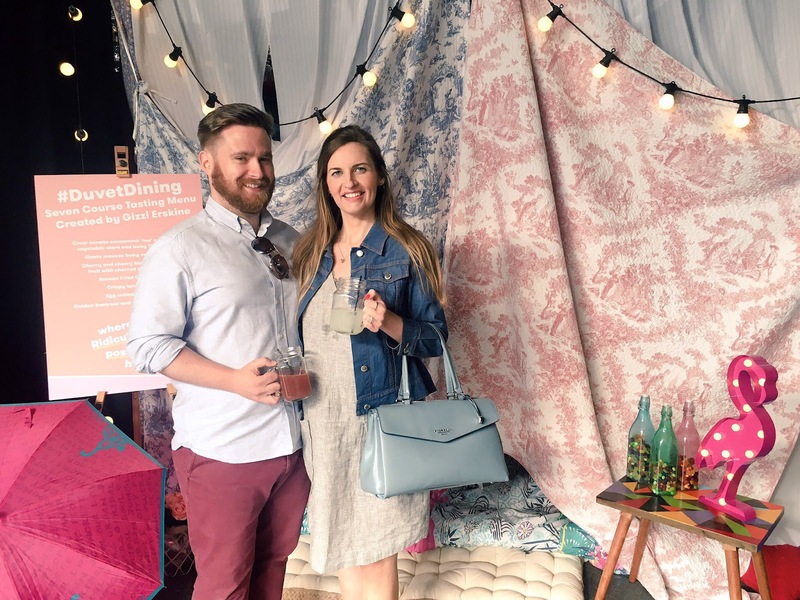 Joining us at our table were husband and wife bloggers Nial & Helen from Pikalily and Donna from designer boutique & blog My Sister's Closet. The menu for the event was created by celebrity chef Gizzi Erskine, a whimsical 7 course affair full of fun and flavour. First course was colourless tomato consume, served in a tea pot. The broth was so intensely flavoured; distilled tomato purity. 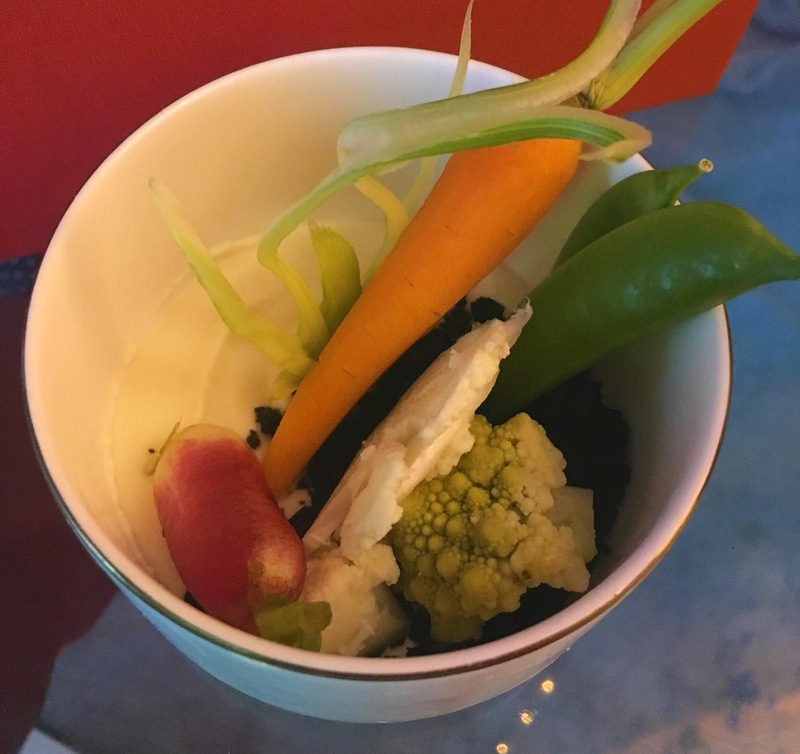 We followed that with a mini vegetable patch, consisting of goat's cheese mousse scattered with black olive soil and studded with crunchy raw baby vegetables. 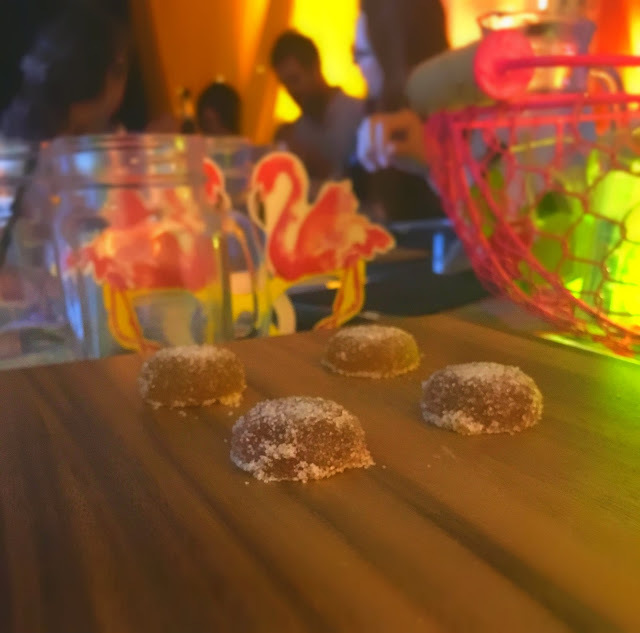 My (almost) favourite course was the mystery meat fruit; a serving of toasted sour dough with a plump cherry on top. 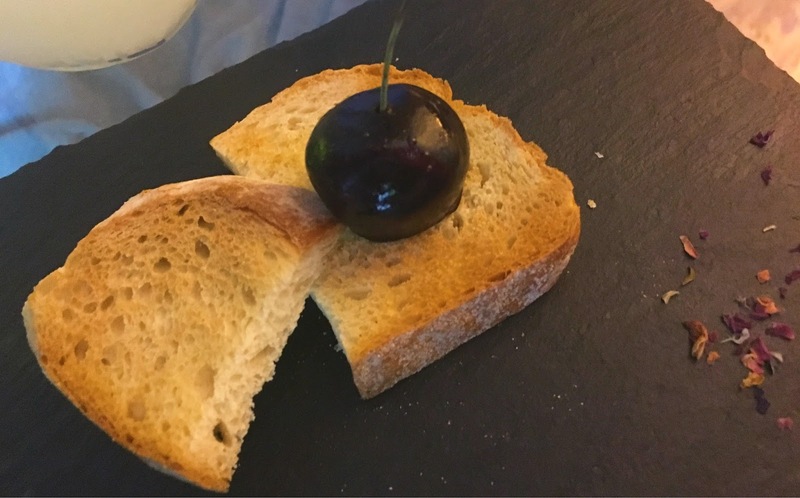 On inspection, the cherry was actually duck pate glazed with cherry jelly; delicious when spread on the hot toast. 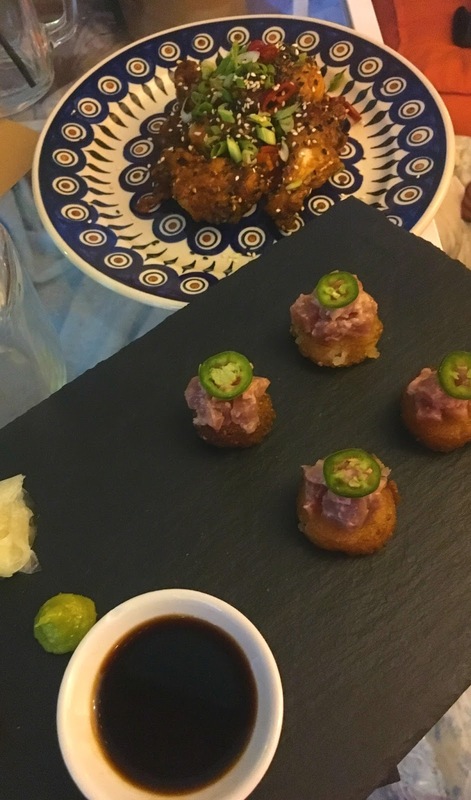 Our next course took us to Asia, with spicy Korean chicken wings and canapes of seared tuna served on tiny rice cakes. 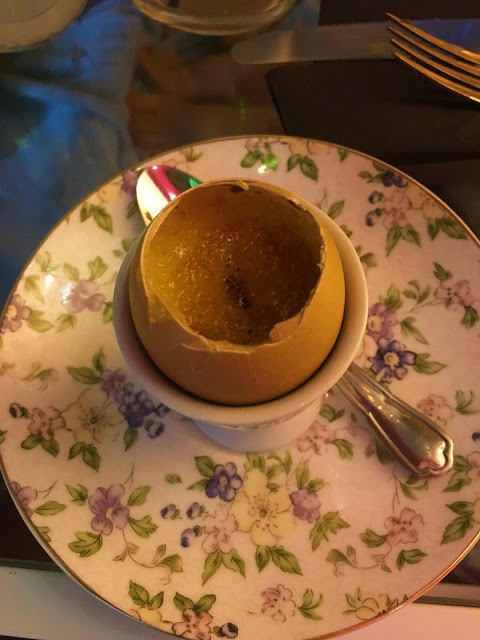 My favourite part of any meal is always the dessert and one of my (many) favourite desserts is crème brulee. They didn't disappoint with a dainty serving of crème brulee in a real egg shell! A fabulous and fun evening, a big thank you to the team at TK Maxx. 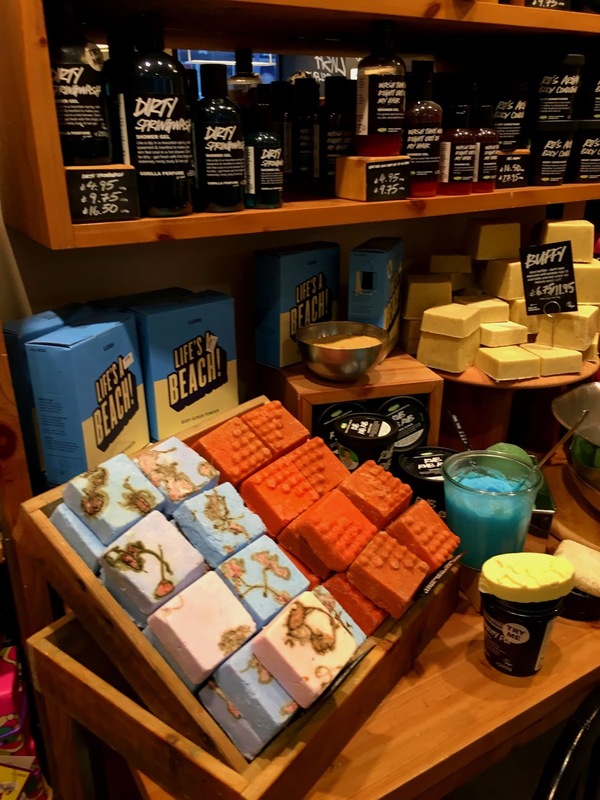 Go visit your local store and find some alternative inspiration! I am not a flexible man, both in body and in spirit. 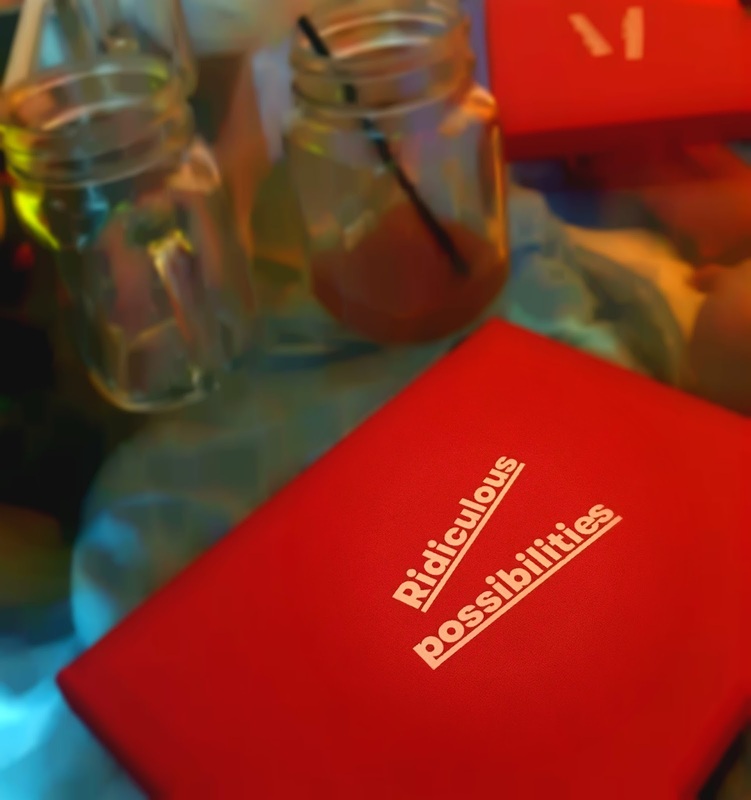 I hold on to my rigidity as a brace, secure in the knowledge of my limits and abilities. However, I was intrigued by the concept of trying an activity which is often overlooked or looked-down-upon by my male peers. 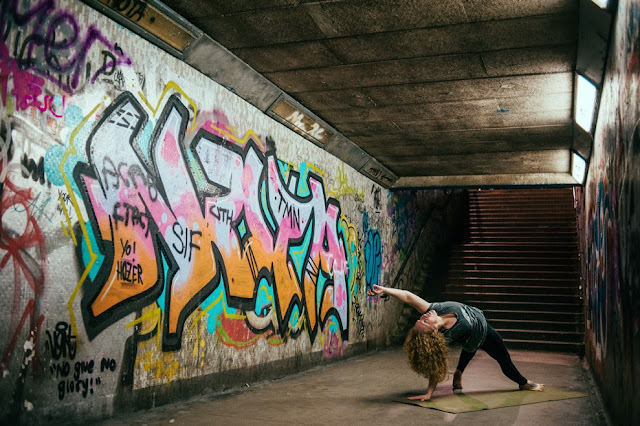 Kim, the founder and instructor of Seventh Heaven yoga kindly invited me to challenge my preconceptions and try her 6 week beginner yoga course. Yoga is not a word that often featured in my vocabulary. In fact, my only experience of yoga prior to this was playing as Dhalsim in Street Fighter II. Stepping into the studio, I was confronted by my greatest fear: other people. I like to think of myself as an independent person and I often don't give a flying feck what other people think of me but I always feel exposed and embarrassed anytime I have to engage in any physical activity. I quietly took a space in the back row, unrolled by brand new yoga mat and cautiously awaited my humiliation. Instead I found a welcoming and supportive network of people just there to practice the craft of yoga. You don't go to yoga to look at other people, you go to yoga to reflect and work on yourself. It then dawned on me the goal for my course; to get over myself. 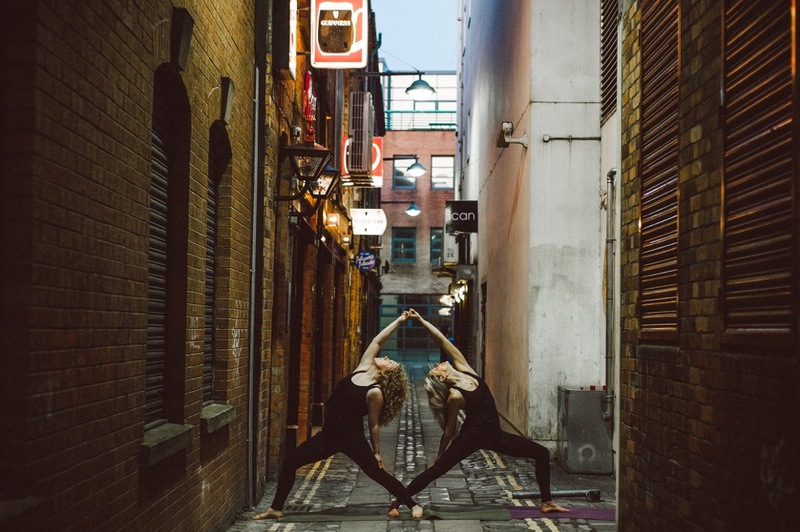 Over the course of the following 6 weeks, I was introduced to many yoga disciplines that I have tried to carry on to my everyday life. 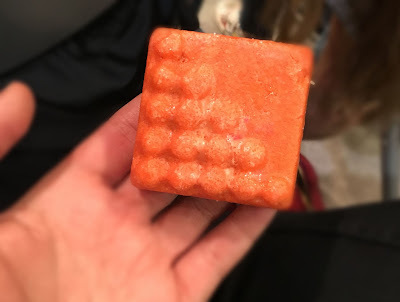 Simple, but strong measures and means to control my body and mind and help me focus, relax and overcome any anxiety. The basis of the exercises comes from the uijyai breathing; deep focused breaths drawing in through the nostrils and out through the mouth. I admitted to Kim I was self-conscious and overthought the breathing, concentrating too much on trying to perfect the distinct wave sound and therefore defeating the purpose of the breath. I used to be a regular gym goer but have fallen off the wagon severely in the past 2 years so I was unaccustomed to any real physcial exercise and while yoga can be relaxing, it is also physically engaging; using your own body weight and muscle to hold varying poses. Over the course of the programme, I was able to discover where my weaknesses (of which there are many) lay and began to understand where I could improve. Finishing each session, I was knackered but content. When I posted on twitter that I was attending the classes, I got a reply saying I didn't seem like the yoga type. I brushed it off with my usual self-deprecating and sarcastic humour but it struck me; "Why should there be a type of man who goes to yoga?" While it is true, the majority of the class members were female, there were a few regular male participants. The worst thing that can happen from a man going to yoga is that he improves his flexibility, his strength and his wellbeing. What kind of idiot would want that?! The introductory course has now finished and Seventh Heaven will be taking a summer break in the next few weeks but makes sure to check out the site for upcoming events such as the Summer Solstice and for the return of the autumn classes. Thanks again to Kim for her kind invitation, support and guidance. Watch out on Instagram and Twitter as I work on some of the core poses and practices in the coming weeks. Now it's no secret that I am a dedicated Ground customer. I've frequented their Waterstone's and Wellington Place coffee shops on many occasions and had the odd little feature on my blog here and there. Ground are challenging aspiring and established photographers to capture the perfect Ground Espression; a photo that sums up the atmosphere and ethos of Ground. The selected photographs will be turned into a coffee table book available to purchase with all proceeds being donated to the Ground Honduras Project. On top of this, one winner will be selected for a trip of a lifetime to New York! 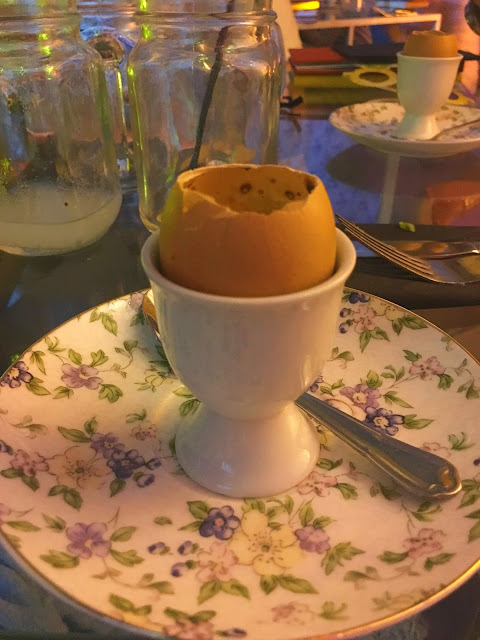 I am by no means an accomplished photographer and when it came to editing images for this post I struggled to choose so I thought why not just make a coffee-loving chronicle of my various visits to Ground over the past few years. So without further ado, have a look at the rest of caffeine-fuelled captures and let me know what you think! Good luck to everyone who enters, but let's face it; I have this one wrapped up. Should I start packing now? Click here for full terms and conditions of the competition. 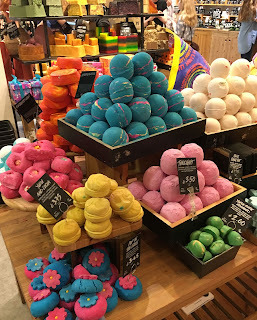 I recently attended Lush Belfast's first ever blogger party to celebrate the launch of their new Father's Day collection. I've been a fan of Lush for many-a-year now and it's exciting to see them embrace the Belfast blogging community. 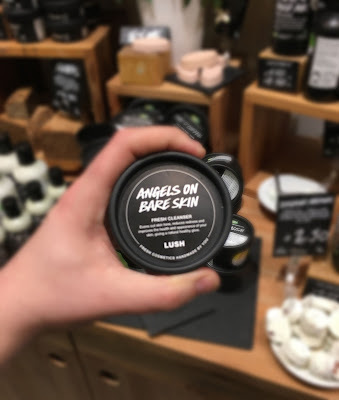 We were warmly welcomed by the enthusiastic team who started the night with a bit of a Q&A session on our favourite Lush pieces, giving great insight into the production and thought behind each product we take for granted. The aptly named The Rough With The Smooth. Never one to shy away from a hands-on experience, the team got everyone involved in creating their own tub of Angels on Bare Skin, their best selling cleanser. 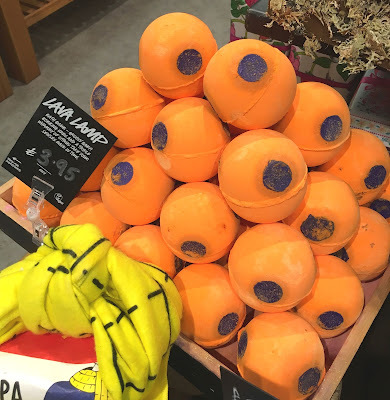 Truthfully, as good as it is, it wouldn't be my first choice just because of the lavender scent. 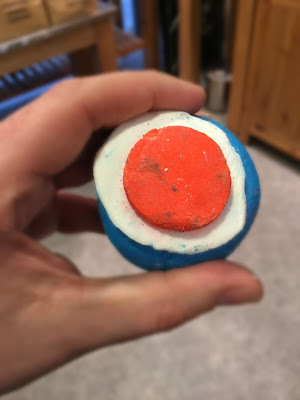 However, my better half has nabbed the tub and is adding it to his current grooming routine and is praising the results. Made by my own fair paws! 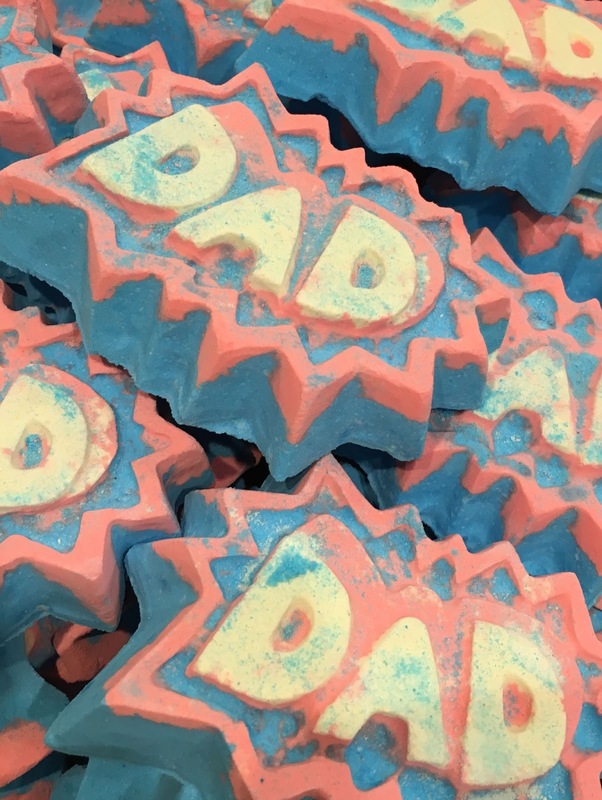 After getting ourselves suitably cleansed and crafty, it was on to the big reveal; the brand new, never before seen, exclusive etc etc Father's Day range! 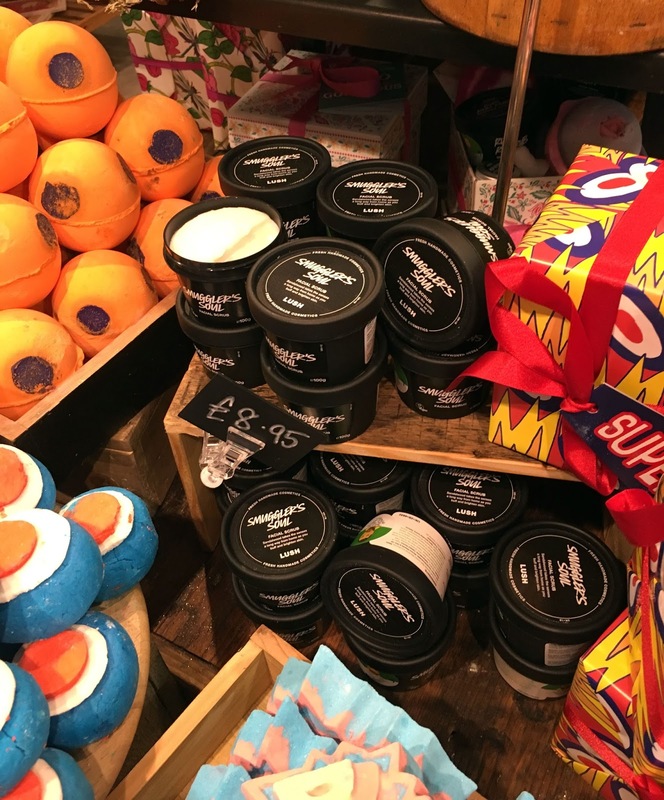 While all Lush products are designed to be unisex, the Father's Day collection is created to help your old man to relax and pamper himself. Gone are the days of soap on a rope, cheap aftershave and naff shower gel sets, the new range includes a mixture of fun and fresh bath bombs, bubble bars, shampoo bars and soaps. This range includes the new face scrub and shampoo bar. 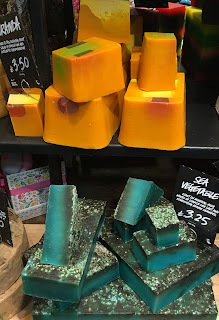 A zingy, citrus bomb inspired by the 70's must have! The closest thing to a Parka and Vespa for reliving his youth. While not new, this fragrance is one of my favourites. It has a fresh, masculine scent and bring a bit of the outdoors to your day. 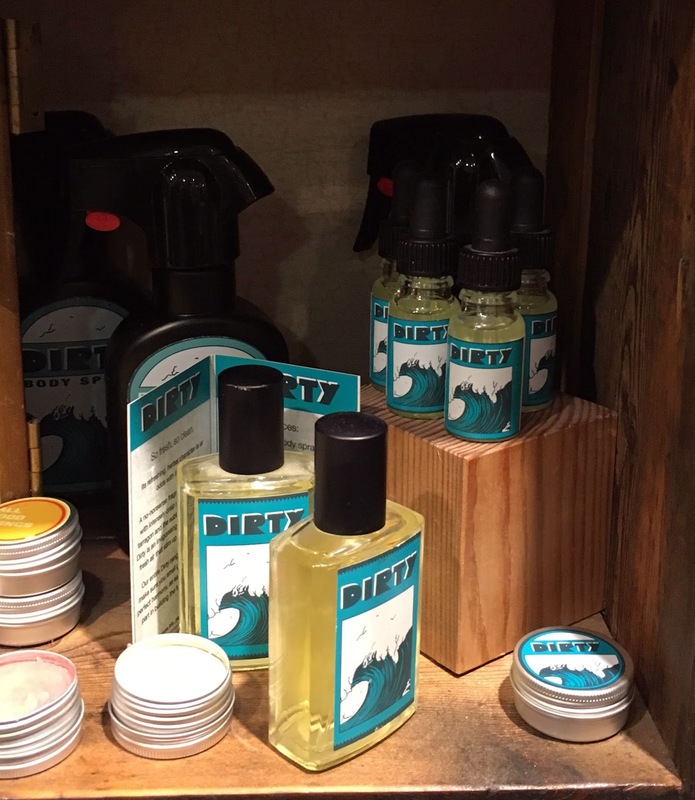 Pick up the solid perfume as a little Father's Day sock filler! You'll always be spoiled for choice in Lush and it will be hard to resist picking up something for yourself while you're there. 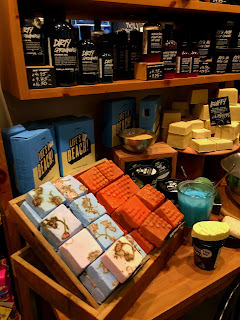 Thanks to the team at Lush for inviting me! Let me know your Lush favourites in the comments below.